Mumbai is the capital of Maharastra State and the gateway to this beguiling subcontinent. Of the four great cities in India, Mumbai is the most cosmopolitan, spear heading India's move in to the 21st Century. Breakfast at hotel. This morning assisted in your transfer to the airport to connect the flight for Bhavnagar. On arrival in Bhavnagar you are received and transferred to the hotel. Bhavnagar is fifth largest city of Gujarat and second largest city of Saurastra. Bhavnagar is known as the cultural capital of Saurastra. Bhavnagar is a coastal city, located in the eastern coast of Saurashtra, known as Kathiawar. Bhavnagar is city of education and culture, known as cultural capital of Saurastra. Gaurishankar Lake: A dry lake, it is currently used for organizing fairs and other public events. It also has a picnic spot nearby and a beautiful garden known as Pil Garden. Velavadar Sanctuary: This is the home of the Indian black buck. Velavadar in the Bhal region of Saurashtra is a unique grassland ecosystem that has attracted fame for the successful conservation of the black buck - the fastest of the Indian antelopes, the wolf and the lesser florican. Once found in open plains throughout the country and the state of Gujarat, its largest population at present occurs in Velvadar National Park. This exclusively Indian animal is perhaps the most graceful and beautiful of its kind. It has ringed horns that have a spiral twist of three to four turns and are upto 70 cm long. Takhteshwar Temple: In the middle of city, on a hill a temple was built by Maharaja Takhatsihnji in 1893. This temple provides paqnoramic city view. The temple and whole compound is made of shining white marble. This is also a wide place to worship lord Mahadev and also a picnic point. Return back to the hotel after the sightseeing. Overnight will be in Bhavnagar. Palitana lies at the foot of the Shatrunjaya Hill, with the Shatrunjaya River flowing to its south. The sacred hill rises in a crescendo of magnificent temples - 863 in all that soar in marble splendour to the top of the hill. The temples were built over an impressive span of 900 years with each generation of pilgrims making its contribution to the shrines of Shatrunjaya. Return back to the hotel in the evening. Overnight will be in Bhavnagar. Enjoy your breakfast at the hotel. After breakfast drive to Ahmedabad. Sabarmati Ashram or Mahatma Gandhi's Home in Ahmedabad. Situated on the banks of the Sabarmati River, the ashram was set up by Gandhiji himself and was the central point of the Indian Freedom Movement. There is a museum inside the ashram. Mahatma Gandhi used to spin his charkha form the ashram itself. In those days the ashram was known as the Satyagraha Ashram. The entire ambience is beautiful here as it is free from the bustle of the city life. Jama Masjid in Ahmedabad. It was built by Sultan Ahmed Shah in 1423 and so, there is a historical flavor added to it. Built in yellow sandstone, the structure has 260 pillars supporting 15 domes of varying heights. The Jama Masjid reflects a fine blend of the Hindu and Islamic styles of architecture. If you are interested to know more about Muslim architechture, then you can also visit the Rani Rupmati Mosque in Ahmedabad, the Jhulta Minara in Ahmedabad and the Sidi Sayed Mosque in Ahmedabad. The latter is famous for its beautiful Jali work on the walls. 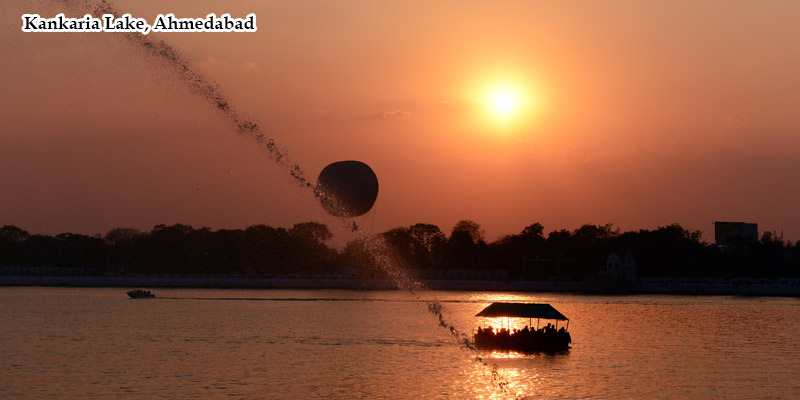 The Kankaria Lake in Ahmedabad is one of the finest lakes in the city. Constructed in 1451 by Sultan Qutub-ud-din, the lake has a beauty of its own. There is an island garden in the middle of the lake which is known as Nagina Wadi. Besides, you can also enjoy the green parks or take a look into the aquarium, boat club, a zoo and a natural museum of history around the lake. Return to the hotel after the sightseeing. Overnight will be in Ahmedabad. Enjoy your buffet breakfast at the hotel. Afterwards drive to Mount Abu via Modera and Patan. Patan is one of the historic towns of Gujarat. It is well connected with the rest of India, via a number of means, like buses, trains and air services. Thus, getting to Patan is not difficult. The city is famous for its architecturally beautiful buildings and structures and peaceful environment. You can explore the royal majesty of the place and enjoy the spirit of the state at its best here. Mount Abu is as diverse as the city itself. It was once a part of the Chauhan kingdom of Rajasthan and served as a summer resort for the Rajput kings of the region. After that, it was leased by the British government from the then Maharaja of Sirohi for use as the headquarter of the resident to Rajputana (another name for Rajasthan). On arrival check in at hotel. Rest of the day free at leisure. Overnight will be in Mount Abu. Enjoy your buffet breakfast in the hotel. After breakfast embark upon your sightseeing trip which would include your visit to Delwara Jain Temples. Afterwards drive to Udaipur enroute visit the Ranakpur Jain temples. The main tourist attractions of Ranakpur are its famous temples. the Ranakpur temple complex is a must see. The main Chaumukha temple (Four-Faced Temple) is dedicated to Adinath, the first tirthankar. The two other Jain temples in the complex are dedicated to Neminath and Parasnath. There is also the Sun temple and the Amba Mata temple near the main complex. Continue the drive to Udaipur. On arrival check in to the hotel. Rest of the day free at leisure. Overnight at hotel. Enjoy the breakfast at the hotel. Afterwards this morning drive to Dungarpur. Dungarpur is a small city located in the western Indian state of Rajasthan and is famous for its temples and palaces. There is a good road network that connects Dungarpur to other cities in Rajasthan. Upon arrival check in to the hotel. Bhuvaneshwar, 9 km, has a famous temple of Lord Shiva and the place is the venue for a colorful fair held on the fifth day after Holi. Return back to the hotel after the sightseeing. Overnight will be in Dungarpur. Enjoy your breakfast in the hotel. Afterwards drive to Ujjain. UJJAIN is the modern name for Ujjayini. Legend has it that the God-like king Shiva of Avanti commemorated his victory over the demon-ruler of Tripura or Tripuri on the banks of the Narmada bychanging the name of his capital, Avantipura, to Ujjayini (one who conquers with pride). On arrival check in to the Hotel. Rest of the day free at leisure. Overnight at hotel. The Mahakaleshwar Temple, draws the most tourists and pilgrims to this city. The jyotirlingam is south-facing and thus known as Dakshinmukhi. Other famous temples are Harsidhhi Durga temple, Chintaman Ganesh temple, and the shani temple of Triveni. The Gadhkalika temple was believed to be frequented by the poet Kalidas and was last renovated by the Scindhias, while the Kaal Bhairav temple is an important centre of tantric worship. A big crowd-puller is the recently built ISKCON temple, while Prashanti Dham, the Sai Baba ashram is another popular holy site. Mandu is a celebration in stone of life and joy, of the love of the poet-prince Baz Bahadur for his beautiful consort, Rani Roopmati. The balladeers of Malwa still sing of the romance of these royal lovers, and high up on the crest of a hill, Roopmati's pavilion still gazes down at Baz Bahadur's palace, a magnificent expression of Afghan architecture. Hoshang Shah's Tomb, India's first marble edifice and one of the supreme examples of Afghan architecture. The impressive dome, the intricate marble lattice work, the porticoed courts are some of the memorable features of this ancient structure. Jami Masjid, was inspired by the mosque of Damascus. The sheer hugeness of the structure coupled with a stark simplcity of design, is really overwhelming. Rani Roopmati's Pavilion, was built as an army observation post. It served a more romantic purpose as Roopmati's retreat. From this picturesque pavilion perched on a hilltop, the queen could gaze at her paramour's palace, and also at the Narmada flowing by. Afterwards drive to Indore- Planned and built by Rani Ahilyabai, the brave Holkar queen, Indore lies to the extreme west of Madhya Pradesh on the banks of the rivers Saraswati and Khan which unite at the centre of the city. The bustling and vibrant city, 186 km from Bhopal, derives its name from the 18th century Indreshwar temple. Bijasen Tekri- A 2 minutes drive from the airport leads you to a hillock on which was perched a guest house of the Holkars, now converted into Border Security Arms Museum, as well as a small temple of Bijasen Mata, built in 1920, which has a magnificent view of the sunset. A mela (fair) is held during the Navratri. A good picnic spot, with a breathtaking view of Indore city by night. Rajwada- Synonymous with the heart of Indore city, it stands today as a mute witness to the bygone splendour of the Holkarrulers. This 200 year oldseven-storeyhistoric palace of the Holkars is built-in a mixture of Muslim, Marathaand French styles. The lower three floors are made of stone and the upper floors are made of wood, which made it very vulnerable to destruction by fire. Rajwada was burnt three times in its history; the last fire in 1984 took the greatest toll. Today only the front facade remains. Recent renovations have recreated some of the old glory of this beautiful palace. Gomatgiri- The Jain Samaj has constructed a 21 feet statue of Lord Gomateshwar, a replica of the Bahubali statue of Shravanbelagola. Also built here are 24 marble temples with shilars for each tirthankar. Return to the hotel after the sightseeing. Overnight will be in Indore. BHOPAL, Capital of Madhya Pradesh, is fascinating amalgam of scenic beauty, historicity and modern urban planning. It is situated on the site of an 11th century city, Bhojapat, founded by Raja Bhojapal. The founder of the existing city was, however, an Afghan soldier of fortune. Dost Mohammed (1708-1740). Old City (Chowk)- this fascinating maze of alleys has old houses and shops from the days of the nawabs and begums. You can buy the famous Bhopali beadwork bags, caps, tussar silk, silver jewellery, spices and ittar in the markets here. At the centre is the famous Jami Masjid built by Begum Qudsia, while another famous mosque close-by is the Moti Masjid. Taj-ul-Masjid - this mosque is impressive due to its sheer size it has a large courtyard and tank and an enormous pillared prayer hall. Bharat Bhavan - one of India's most famous centres of art, this complex has a tribal art gallery with fascinating collections of Bastar art, as well as a modern art gallery. Regular events and exhibitions are also held here round the year. Archaeological Museum - This has an impressive collection of Jain and Buddhist sculpture dating from 200 BC to the 12th century AD. Rashtriya Manav Sangrahalaya - This is the Museum of Mankind spread over the grounds surrounding the upper or larger lake. It has exhibits of tribal houses, costumes, jewellery, kitchenware, instruments and tools. Return to the hotel after the sightseeing. Overnight will be in Bhopal. Enjoy the breakfast at hotel. Start the morning with a full day excursion to Bhojpur and see the prehistoric caves and cave dwellers at Bhimbetka. Return to Bhopal for overnight stay. After an early breakfast visit Sanchi - Stupas and other Buddhist site. Sanchi is a serene hill crowned by a group of stupas, monasteries, temples and pillars dating from 3rd Century BC to the 12th Century AD. The glory that was Sanchi, an ancient seat of Buddhist learning and place of pilgrimage, can still be experienced in its complex structures where many Buddhist legends found expression in the rich sculpture. Sanchi was virtually forgotten after the 13th Century until 1818, when General Taylor, a British Officer rediscovered it, half buried and well preserved. Later in 1912, Sir John Marshal, Director General of Archaeology ordered the restoration work at the site. Later in the evening you are assisted in the transfer to the Bhopal station to board Shatabdi Express for Delhi. On arrival, again you will be assisted and transferred to the International airport to board homeward flight.